The new Community Gateway programme was unofficially announced in September 2015. At the time, Pete and Patch Linden provided me with an overview of the programme, which involves a number of new user oriented groups and established communities across Second Life. More recently, I put out a call to those engaged in the programme to contact me about their work, with a view to presenting an unfolding series on the programme, starting with a look at those who responded to the call. For the first of these pieces I sat down with Aullere Ocello, owner of Helping Haven Gateway (HHG). 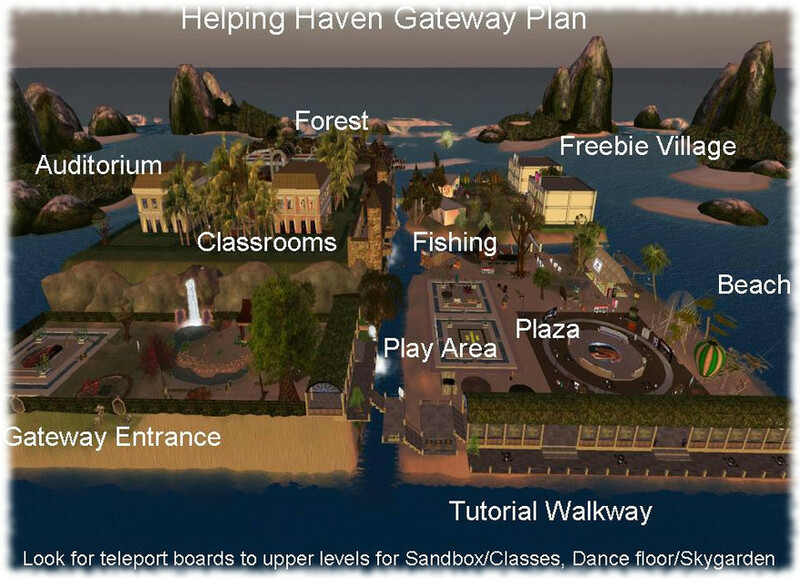 Those who have been around Second Life for a good few years and who had the good fortune to pass through Help People Island prior to its closure in 2011, might have an odd sense of deja-vu; if they drop into Helping Haven Gateway for the first time. There’s nothing accidental about this: the core team behind HHG are all Help People Island veterans, as Aullere explained to me. The region itself is spilt into four areas (as shown above, looking across the region from the west side) at ground level, each area presenting multiple opportunities for learning, having fun and engaging with other users. The Gateway Entrance is the first point of contact with Helping Heaven for newly registered users, offering an initial introduction to learning the basics – walking, text chat, camera movement, media – presented in a familiar walk-through approach. From here, new arrivals are encouraged down into the plaza area. One of the core ideas for the new Community Gateway Programme is the ability for those presenting a gateway to be able to bring new users directly into Second Life via their own web presence. While Helping Haven do indeed have their own website, delays on the Lab’s side in getting the new user registrations API fully up-and-running means that it isn’t currently being leveraged by HHG. So, how do they attract new registrants? Once new users reach the plaza, they are free to wander. Volunteers are on hand to provide assistance, and while there is a main Tutorial Walk on the north side, which continues the lessons from the Gateway Entrance, so too are many of the tutorial boards repeated across the plaza and the rest of the region. This might appear to be a little redundant, but it actually serves a two-fold purpose. Firstly, it means that people don’t have to follow a prescribed route in order to learn things, but can wander at their leisure, encountering lessons and ideas / techniques as they go. This in turn means that any risk of a new user feeling a sense of information overload as a result of having to follow a prescribed path through multiple lessons as soon as they arrive, is greatly mitigated . Thus the entire learning process becomes a far more relaxed, natural, learn-as-you-go-and-in-your-own-time affair. To further support new users, HHG also have classrooms were more formal, trainer-led lessons are held. These cover both viewer-based learning and “traditional” lessons like in-world building, while others cover broader activities, such as music and DJing in SL. Some of these lessons extend beyond the region, as well. For example, although currently on summer hiatus, HHG regularly presents sailing lessons which take new users out onto Blake Sea, where they can not only learn to handle a boat, but also get to see Second Life and much of what it has to offer first-hand. Within the HHG region there are also games and activities to help new users, and there are also regular social events, all of which are geared to helping new users gain more familiarity with SL as a social platform with many different potentials and possibilities. The Tourist Office additionally provides sets of landmarks to places of interest, together with lessons on using tools like Search and Places so that new users can find their way around. To encourage their sense of adventure, Dahlia Jayaram’s sailing and ballooning trips are also presented, showing new users the breadth of opportunity to travel throughout Second Life and, through the linked eBooks Dahlia has produced on her mainland balloon trips, a chance to see more of what is on offer in-world. One of the powerful aspects with the HHG team is that they are very much a “family” – many of those involved have been working together in helping new users for the eight years of HHG’s and HPI’s combined history, and they are all still fully engaged in the platform pursuing their own interests. Which is not to say that HHG refuse requests from people wishing to become helpers. Built and run by people well-versed in helping new users get started in Second Life and building on 8 years of in-world experience and activities, Helping Haven offers a wealth of learning and social activities and offers a genuinely warm welcome to all. I’ll be making a return to see how things are progressing once the updated new user registration API is made available by the Lab. Are you running a new Community Gateway? Want it featured in this series? Contact me in-world, or use the Contact Me form on this blog and drop me a line. …or I was premature in my original post; it’s a matter of perspective :). The problem has been that re-working the RegAPI to meet both the needs of third-party gateways and fulfil the Lab’s legal obligations of data security on behalf of users has proven to be somewhat more complex than had originally been anticipated.